Re-Write and Re-Sketch: How Should We Respond To The Global Challenges? 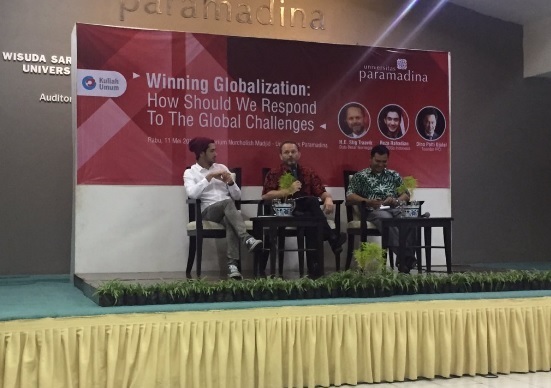 Wednesday, 11/05/2016, Foreign Policy Community Indonesia (FPCI) for Paramadina Chapter held a forum with the theme of "Winning Globalization: How Should We Respond To The Global Challenges?" This event is made based on the challenges that may people in Indonesia might face for the competitiveness aspects. The general lecture was lead by the head of International Relation Program of Paramadina, Mr. Emil which he believes that as youth has a main role in the next decade. The first discussion was delivered by Mr. Stig Traavik as the Ambassador of Norway. Then, the forum was continued by Mr. Reza Rahadian known as a famous actor but here as the Ambassador of Sustainable Development Goals of Indonesia (SDGs Indonesia). From the first discussion with Mr. Stig, the discussion were more about the profile of the developed Norway to respond the global challenges. The materials that he delivered was to make a review on How Norway could be a developed and a self sufficient country from many fields. A small economy in a globalized world plays a crucial role. Norway depends on their Maritime fields, Which it made Trade as one an important matter for the economic growth. Meanwhile, for the trends that Norway made for their country are: deregulatory pressure, increased cross border, growing number of contact then developing a rapidly stronger force. But, the main concern for Norway is to Maximize the maritime. Meanwhile, being a big oil and gas producer are as the second alternative path. In this case he believes that regional security threats are going global so this has to be concerned to. Talking about the cooperation between Indonesia and Norway in facing challenges, Mr. Stig said "Indonesia has many to offer," he believes that beside the number of population of this country could create a good economic growth if it is managed wisely because beside the human resource, Indonesia has a good nature resource too. The next discussion with Mr. Reza Rahadian is morely about actions that we can do in facing the Global Challenges. Some of the example is the program that he has been fundraising, namely "Bring water to life" A project to a village in providing people that can not get access for fresh water. The program was to build a project of Intervention Solar Water Installation. With this kind of action, he believes that it could impact the others in responding to global challenges. The second strategy is to know the three order. "Fact, Problem, and solution," he said. This is to consistently help us as a developing country in creating a better future and life towards sustainability. The session was closed by some of questions regarding to the topic. In conclusion, people need to increase their willingness to develop their own country to face the global challenges with many ways including from the aspects of environment, politic, economic matters, etc.